It's been a very bad week for social media companies. The Twitter logo is shown on an LCD screen in front of a displayed stock graph in this April 29, 2015 photo illustration. Twitter plunged before the opening bell Friday on weak user numbers, a day after a historic rout at Facebook. NEW YORK — Twitter plunged before the opening bell Friday on weak user numbers, a day after a historic rout at Facebook. Twitter, like other social media platforms, says it's putting its platform over user growth. That leaves investors seemingly unable to value what the biggest companies in the sector, which rely on their potential user reach, are worth. Shares of Twitter Inc. slumped 12 per cent on what was otherwise a strong quarter, it scrambles to clean up a user base in a supercharged environment. Twitter had 335 million monthly users in the quarter, below the 339 million Wall Street was expecting, and down slightly from 336 million in the first quarter. That overshadowed a strong monthly user growth of 3 per cent. 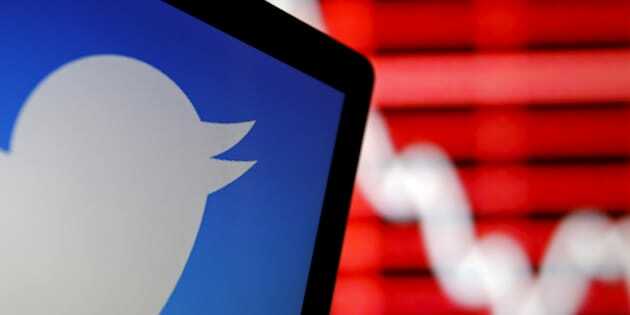 Twitter said its monthly user number could continue to fall in the "mid-single-digit millions'' in the third quarter. Long criticized for allowing hate, abuse and trolls to run rampant on its platform, Twitter has begun to crack down, banning accounts that violate its terms and making others less visible. Twitter is now attempting to rein in the worst offenders after years as one of the Wild West corners of the internet. At the same time, it must convince people it's the go to platform in social media, and it is absolutely dwarfed right now by Facebook. Facebook has more than 2.23 billion users while its apps WhatsApp, Instagram and Messenger each have over 1 billion. Twitter on Friday reiterated its efforts to "to invest in improving the health of the public conversation'' on its platform, making the "long-term health'' of its service a priority over short-term metrics — such as user numbers. As part of these efforts, Twitter said that as of May, its systems identified and challenged more than 9 million potentially spammy or automated accounts per week, up from 6.4 million in December 2017. The company has previously disclosed these numbers. A Washington Post report put the total number of suspended accounts in May and June at 70 million. The Associated Press also found that Twitter suspended 56 million such accounts in the last quarter of 2017. While Twitter maintains that most of these accounts were dormant and thus not counted in the monthly user figure, the company also warned that its cleanup efforts could affect its counted user base — without giving specific numbers. "We want people to feel safe freely expressing themselves and have launched new tools to address problem behaviours that distort and distract from the public conversation,'' CEO Jack Dorsey said in a prepared statement. Twitter's second-quarter net income hit $100.1 million, after a loss last year during the same period. It's the company's third profit in a row, the third it has ever posted. Facebook shares plunged 19 per cent on Thursday in the biggest one-day drop in history. The Thursday stock collapse vaporized $119 billion of the company's market value. CEO Mark Zuckerberg saw his net worth fall by roughly $16 billion as a result. Facebook's tumble was the worst-ever single-day drop in value for a U.S. company, and led a sell-off in technology companies that offset solid gains in other areas of the market, including industrial and energy stocks and consumer goods companies. Facebook's share price had hit an all-time high of $217.50 on Wednesday, after warning investors that it sees slower revenue growth ahead, and that its user base and revenue grew more slowly than expected in the second quarter.